Sussex manager Mark Robinson has welcomed the opportunity to coach the England Lions side again. Robinson will travel to South Africa in January, having been involved in the tour of Sri Lanka earlier this year. "I had a great time with the Lions last winter and it was a good learning experience for me," the 47-year-old told BBC Sussex. "To still be a part of it and have an opportunity to be involved at the high level is exciting." "There are always sub-plots to these type of tours. Individuals go in thinking if they have a great tour then they could really put themselves forward for the West Indies tour and then eventually for the Ashes." After a successful trip to Sri Lanka with the Lions, who won the unofficial Test series against Sri Lanka A, Robinson applied for the position of England technical director. However he did not get the post, with former Sussex coach Peter Moores reappointed by the England & Wales Cricket Board. "I was in the shake-up for the main England job and missed out there, which I was disappointed about," he said. "The ECB spoke to me at the back end of the summer about the opportunity of coaching the Lions again and I had to speak to Sussex to make sure it was okay to be released. "I'm an experienced county coach and team coach now. You hope you can bring some of those skills." The headline name in the Lions touring party is Warwickshire batsman Jonathan Trott, who has received his first international call-up since leaving England's Ashes tour in November 2013 with a "stress-related illness". "Jonathan will have had a lot of support and people advising him to make sure he is in the right place to go abroad," Robinson said. "He had an outstanding second half of the summer and I'm sure he is a player England would love to have available and the potential to pick. "There are always sub-plots to these type of tours. "When we went to Sri Lanka, England had not done so well in the Ashes and there were Test match spots up for grabs. There was no spinner and potential for an opening batsman. "It is the same again. Individuals go in thinking if they have a great tour then they could really put themselves forward for the West Indies tour and then eventually for the Ashes." 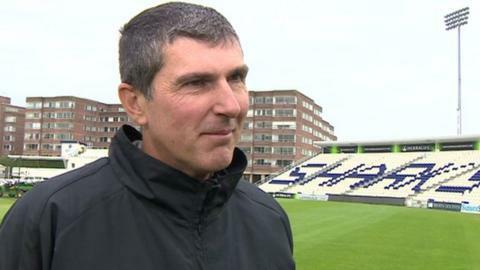 Meanwhile Robinson, who has been cricket manager at Hove since late 2005, has dismissed any concerns that Sussex will be left short of coaches during his time in the southern hemisphere. "I'm away in January and will be back in February and March and the whole of pre-season," he said. "The boys are back full-time on 9 March. "Carl Hopkinson is away in February [with Ireland at the World Cup] but we have good cover with Mark Davis. The key bit is for the club to make sure we have everything we need - but it gives opportunity for other people to grow and take responsibility. "If I ever leave or any of the other coaches leave then we have succession planning in place."